As we come together waiting on God and seeking His face, it is our prayer that God Himself will visit us in an unusual manner. The prayer meeting will be from 7pm to 8pm on each day. Listed below are the prayer points. As we celebrate the 16th anniversary, pray for HOTW Pastorate and ministers for special grace and anointing to carry out the task of shepherding the congregation. Pray for more grace and anointing upon the ministers and workers in the house. Thank God for answered prayers of members to date. Let's pray that God would fulfill all His good promises and prophecies concerning this year of divine fulfillment of HIS purpose in Jesus name. Let's ask for a deeper relationship with Him and pray to God to help us to truly love Him afresh with all our hearts, soul and strength. We pray for total commitment from His people more than ever before and to produce fruits that would abide unto God’s glory. Let God remove everything retarding the progress of HIS assignment at HOTW and in our lives. Ask God to make us great according to His divine plans for us. Let's pray for completeness without anything missing . Scripture Focus: "And this is the confidence that we have in Him, that, IF WE ASK ANY THING ACCORDING TO HIS WILL, He heareth us: And if we know that He hears us, whatsoever we ask, we know that we have the petitions that we desired of Him"
We hope to see you there.......Indeed, God answers prayers!!! As we come together waiting on God and seeking His face, it is our prayer that God Himself will visit us in an unusual manner. The prayer meeting will be from 7 pm to 8 pm on Monday and Tuesday. Pray against spiritual barrenness. Pray that the Lord will cause every form of self interest, self love, self concern that may hinder our spiritual growth to be removed.(Matt. 21:18-22, Isaiah 66:7-10). Pray that God will strengthen His people regardless of what we may be going through. That we will continue to stand firm and not give up until we see the hand of God in our affairs. 2 Cor. 12: 8-10. Also we ask for the peace of God in the midst of storm. People will continue to trust God. Isaiah 26:3-4. Let's continue to ask God to intervene in Nigeria,that the Church of God will be strengthened, purified and United through all that is happening. Remember our young sister Leah. 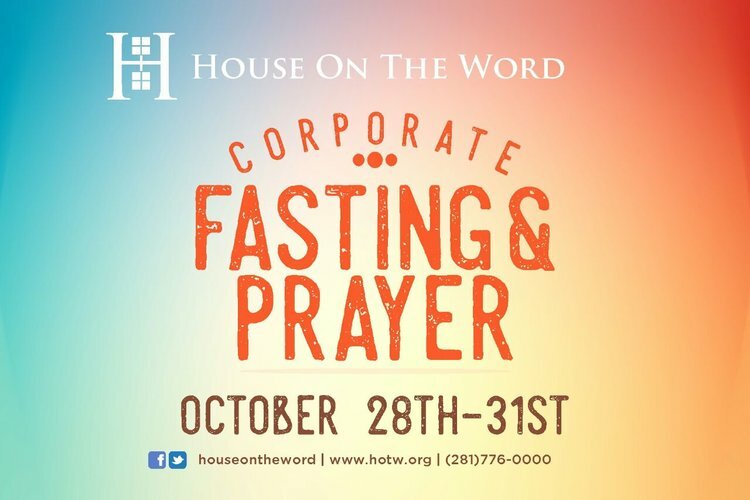 House on the Word will embark on a Corporate Fasting and Prayer during the first seven days of each month of the last quarter of the year 2017. Please join us. October: Sunday, October 1st through Tuesday, October 3rd. November: Sunday, November 4th through Tuesday, November 7th.
" For to me, living means living for Christ, and dying is even better. Philippians1:20-21. Let's Pray that God should cause every all House On The Word members to see like Paul see the need for aggressive evangelism. Lets pray that God should cause every member of House On The Word to know that the goal of evangelism is heaven and to strive to reach out to unbelievers, with the aim of realizing this goal in Jesus name. Let's pray that God Should give us apostolic passion for souls, and cause us to have the mind of Christ for the sinners around us. (Acts 6:2-4). Pray that God should cause all House On The Word members to fulfill the purpose of Pentecost; preaching Christ with boldness (Acts 4:31). Pray that God should supply us with all things that make soul winning easy and encouraging. Pray that money shall not be a barrier to fruitful outreaches in the Church. Jesus is coming soon! Let those still on the fence decide for Christ now. Let those who have decided rededicate themselves, casting off weights that burden and the sins that easily beset. The Lord is near. Pray concerning the New House on The Word church building. This is an ongoing prayer till the project is complete. Pray concerning the Children's Ministry. Pray for more grace for the teachers to instill truth and the word into these kids hearts. That the children will be fruitful in God's kingdom. Ask God through Jesus Christ for the forgiveness of your transgressions. Psalm 51:1-4; Proverbs 28:13; Psalm 66:18. Pray against spiritual barrenness. Pray that the Lord will cause every form of self-interest, self-love, self-concern that may hinder our spiritual growth to be removed. Matt. 21:18-22, Isaiah 66:7-10. Thank God for encouraging, and for the grace given to us at HOTW to remain steadfast, strengthening the souls of HIS people, encouraging them to continue in the faith. Acts 14:22. Praise God for He will make a way in the wilderness, and rivers in the desert. Isaiah 42:9;43:19; Rev 21:5. Pray for the peace of God in the midst of a storm. Pray that people will continue to trust God. Isaiah 26:3-4. Pray that we will wait on God until He comes through in every situation. John 14:1,18, 27. 1. That HOTW HYPED sermons will be scripturally sound and Holy Spirit imbued. 2. That HOTW HYPED members will have a hunger for studying the gospel for guidance and direction. 3. That HOTW HYPED members would grow in being distinct from the world in love and holiness. 4. That HOTW HYPED prayers would be infused with biblical ambitions, honesty, and humility. 5. That HOTW HYPED members will have unity amid diversity, loving those with whom we have nothing in common but the gospel. 6. That HOTW HYPED memberswill develop a culture of discipleship in which making disciples is viewed as an ordinary part of the Christian life. 7. That HOTW HYPED members remain above reproach, kept from temptation, complacency and worldliness. 8. That HOTW HYPED members develop transparent, meaningful relationships with others. 9. That HOTW HYPED teachers will utilize Scripture to train HYPED members for the work of ministry. 10. That HOTW HYPED songs would teach members to biblically confess, lament, and praise. 11. That HOTW HYPED teachers and members grow in dedication to God’s Word even when no one’s watching. 12. That HOTW HYPED members would share the gospel every week, and see more conversions! 13. That HOTW HYPED members’ giving will be consistent, joyful and sacrificial. 14. That more HOTW HYPED members would use their careers to take the gospel to new places. 15. That HOTW HYPED members would be diligent in their workplaces consistently. 16. That God will raise more HOTW HYPED members to start praying more intentionally. To this end we always pray for you, that our God may make you worthy of his calling and may fulfill every resolve for good and every work of faith by his power” (2 Thess. 1:11; 1 Thess. 1:9–13). We have not ceased to pray for you, asking that you may be filled with the knowledge of his will in all spiritual wisdom and understanding, so as to walk in a manner worthy of the Lord, fully pleasing to him, bearing fruit in every good work and increasing in the knowledge of God” (Col. 1:9–10). I do not cease to give thanks for you, remembering you in my prayers, that the God of our Lord Jesus Christ, the Father of glory, may give you the Spirit of wisdom and of revelation in the knowledge of him” (Eph. 1:16–17; see also 3:14–21). (Romans 15:14–33, Phil. 1:9–11). We will gather in church to pray on the December 27th and 28th from 7pm-8pm. As we thankfully approach the end of the year 2016 and in anticipation of the year 2017, you are encouraged to participate in this prayer and fasting sessions. This will be the last corporate Prayer and Fasting session for the year 2016. We will be waiting on the Lord thanking Him for 2016 and committing our 2017 into His hands. Prayer points will be updated as the Lord leads. God bless you as you partake in this fasting and prayer sessions. In preparation for the new year 2017, we will be fasting and praying from October 28th-31st 2016. We will gather to pray in church every day at 7pm except on Sunday, October 30th. Pray that according to Psalm 65:11, that God will crown the upcoming year with His goodness and that which has seemed elusive from the beginning of the year till now will become possible. As we stand on the threshold of a new year God will cause us to forget the old no matter how good or bad, and look forward to the new (Isaiah 43:18-19). Pray for opportunities for HOTW to develop cooperative relationships with our neighbors of other religion to promote peace and harmony in our growing community. Pray that we will not be terrified by our adversaries. Pray for steadfastness we need to endure suffering without giving up hope (verse 29-30). Pray for ability to give a good witness to Jesus Christ, the Prince of Peace, in our communities and to a “watching world” as we endure this trial. Pray that leaders and members of HOTW can rejoice in the presence of Christ within and among them (verse 4-5). Pray that the power of prayer sustains all of us (verse 6). Pray that “the peace of God which passes all understanding will guard our hearts and minds in Christ Jesus” (verse 7). Pray that God will help us to spur one another on to faithfulness when we gather (verse 8-9). Pray that the power of the Holy Spirit will be poured out among us to bless and strengthen all. Pray for the November to remember programs. 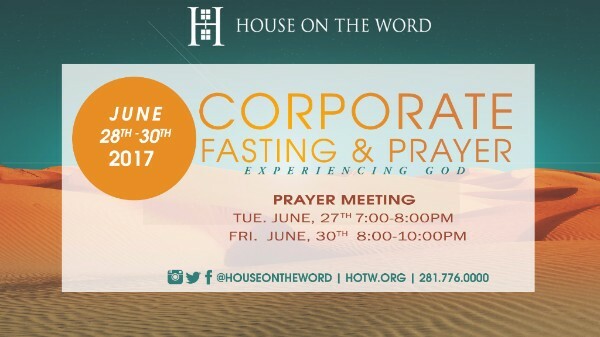 Corporate Fasting and prayer starts August, 22nd through August, 28th 2016. We will all gather in church each day at 7:00pm to pray. Please plan to attend each prayer session. 1. Psalm 92; Psalm 125 for HOTW and ourselves for God's covering and intervention. 3. Pray that the Lord will continue to bring about clarity, and a consistent accurate execution of the vision for HOTW. (Hab 2:2, Prov 29:18, Psalm 119:18,130, Isa 42:7, 1 Cor 13:12, Eph 1:17-18). PLEASE EXPECT UPDATES AS NECESSARY.